It may not be as uncommon a thing now as it was back when we were kids, but it still sounds pretty exciting, doesn't it? I know. My name is Michael Masterson, and I'm a millionaire. Oh, I'm a lot of other things too: a writer, publisher, wealth coach, business owner, entrepreneur - not to mention a husband and father. But for the purposes of THIS letter, and what I can do for YOU, the fact that I'm a millionaire is what matters most. I wasn't born wealthy. Far from it. I made my millions on my own, as an adult, using a simple set of steps - six of them, to be exact - that enabled me to become rich in a surprisingly short period of time. Along the way, I've shared these steps with several people. Not just any people, of course. Only those who I knew were truly interested in making a lot of money, safely but relatively quickly. And everyone who has followed my little system has experienced the same results I have. The fact that you're reading this letter tells me that you, too, would like to be at the seven-figure mark. But that you're not there yet. How long are you willing to wait to be rich? Probably not. Let's face it - by the time you got your money, you'd be too old and tired to enjoy it. At least in the ways you'd be able to enjoy it right now. But what about 30 years... or 20? Again, that's an awfully long time to wait for the payoff. You've got major, urgent uses for that money right now, today, don't you? But with most of the wealth-building plans out there, 20 to 40 years is what you're looking at. The bottom line is, if you want to get rich, you want to do it in a reasonable amount of time. For most people I talk to, "reasonable" means about 10 years or less. And yet... as much as they want to get rich in that time frame, few of those people think that that's really possible. Like almost all of us, they've been trained to think of wealth creation as an outcome of either long-haul scrimping and saving while they wait for the miracle of compound interest to kick in... or too-risky get-rich-quick schemes that they (wisely) don't have an appetite for. Well, I know from my own experience and that of many, many others that there IS another way. But before I tell you how to become a millionaire, I want to give you - just for fun - a small glimpse of what your life is going to actually be like when you ARE one. For so many people these days - and you may be one of them - money is a constant, ever-present issue. Even at a pretty decent annual salary, they still stress over bills ... deny themselves and their families things they want ... and essentially live paycheck to paycheck. Even raises and bonuses don't seem to break them out of that cycle. Well, once you hit millionaire status, those days can be gone forever. The ease and peace of mind that comes with being a millionaire is a matter of simple math. For example, let's say you're a two-person family with a net worth of $1 million earning 10%. That would yield you an annual income of $100,000. Assuming a 35%-or-so tax rate, you'd be left with around $65,000. Out of that would come your housing costs, which generally should be in the neighborhood of 25% of your income. In this case, you'd have roughly $16,250, or $1,350 monthly to spend on those housing costs. And you could figure on about $1,900 monthly for all of life's necessities, things like utilities, food, household maintenance and repairs, car payments, and all the other odds and ends that drain away your cash. As a $1 millionaire, after all those obligations are taken care of, you'd still have about $2,000 left over at the end of each month. Two thousand dollars a month - just to play with! Dinners out... weekend getaways... generous donations to a favorite charity... shopping sprees... you could do whatever you wanted to with that money. And you'd be enjoying it with a clear conscience, knowing you're not "dipping in" to any other fund. Believe me, it is. And it just gets nicer the further into the millions you get - which is a relatively easy thing to do, once you've gotten yourself to that first million-dollar mark. Can you imagine having $95,000 a year - almost $8,000 a month - at your disposal for whatever you wanted to do? Think of the trips you could take. The people and organizations you could help. The grown-up toys you could have. The fabulous meals out. The gifts. The splurges. The sheer fun. And all of it guilt free - because, remember, that $95,000 is what you have left after you've taken care of all your necessary expenses and obligations. And again, the further up into the millions you go, the more amazing the possibilities become. With a $5 million net worth, you'd have around $210,000 extra each year. A net worth of $9 million would yield you in the neighborhood of $345,000 in annual discretionary income. It's an incredible way to live, my friend. And it's the way YOU can live - soon, and for the rest of your life. Want to know how? Then keep on reading. As a financial writer, I've dispensed lots of advice on how to build wealth - through bestselling books, seminars, and one-on-one consultations. But as I picked up on, over and over again, the frustration people were feeling with the amount of time it takes to get rich, I realized there was a need out there. And that I might be able to fill it. So I set out to create a structured step-by-step wealth-building plan based on the same principles I'd used, profited from, and proven - but this time, with an ultra-specific and highly targeted focus: creating a personal net worth of at least $1 million in seven years or less. It wasn't hard. After all, though that particular time frame wasn't a specific goal of mine when I embarked on my wealth-building journey, that's how it played out for me - and how it has consistently played out for everyone else who has used my system. Being a bit of a skeptic myself, I knew that - as much as people wanted a faster way to get rich - there might be some resistance to the fairly radical claim I was making. So rather than expect people to rely on my word and experience alone, I called for reinforcements. As I mentioned before, in the years since I moved into the millionaire realm, I've revealed my system to certain interested people. And those who faithfully followed it has built up a sizeable seven-figure net worth. All of them within seven years at most, and many of them in significantly less time than that. I called on eight of those individuals - people I had personally coached through my system and whose millions I had watched accumulate as a result - to join me in presenting our wealth-building system on audio. The result is The Seven Years to Seven Figures System: Six Steps to Automatic Wealth. It's a densely packed, high-energy audio seminar that will spell out for you - in full detail - a practical and time-and-again-proven way to get rich fast, grow richer each year, and stay rich for the rest of your life. There's no dwelling on theory in The Seven Years to Seven Figures System. This program contains the nitty-gritty nuts-and-bolts information you need to start taking decisive action towards getting rich. Each of the individuals you're going to hear from is out there actively using and profiting (massively) from these very steps. And each one is a phenomenal success and renowned expert on the particular step he reveals to you. Prove to yourself it's possible to make 7 figures in 7 years! The wealth-building secrets and strategies these individuals give you are the same ones they use - each and every day. The "ah-ha" moment that forever transformed my ability to get rich - and how it can be YOUR moment too. Once you experience it, the money will literally start pouring in to your life! The ONE LITTLE NUMBER that will increase your personal productivity exponentially. Write it on an index card and tape it up in your office. You won't believe the difference it makes in your daily output. Remarkably effective secrets for cutting the time-wasters out of your day. Do this, and you will free up enormous reserves of thought and energy that will result in untold dollars. And it's easier than you probably think! Email protocols for wealth-builders. If you're not doing these things now (and most people aren't), you need to start immediately! The tasks you NEVER have to do. This simple two-part question will slash your to-do list in seconds. 13-plus personal organization strategies that will save you HUNDREDS of hours (and make you THOUSANDS of dollars!) each year. Where you should be investing your money right now. Major surprises here that you aren't going to read about in the financial pages - including the unsuspecting companies that could easily double your money fast. The seldom-acknowledged but serious hazards of self-managing your money, putting it into a managed fund, or turning it all over to a broker - and the LITTLE-KNOWN FOURTH ALTERNATIVE you're probably NOT doing but that will make you more money with less risk! How to completely insulate yourself from unacceptable losses. How to use a trailing stop to know precisely when to sell. Which all-too-common investing behavior is almost always a recipe for disaster. You may be doing it right now! Cash poor? This commodity may be even more valuable than money. If you've got some of it, you don't need cash to cash in on the best investment in the world! A crash course in real estate investing that will have you raking in piles of cash while you sleep! Fasten your seatbelt and get ready to find out everything you REALLY need to know to make a killing in the real estate market WITHOUT shelling out a lot of cash upfront or spending all your time scanning listings and touring properties. You'll find out where to buy now (and where NOT to) ... how to negotiate to win (even if you hate the thought of negotiating) ... secrets to assessing a property's true value (so you NEVER pay more than you should) ... and so much more. Shed your fears and get in on the incredibly lucrative and SURPRISINGLY EASY (when you do it our way) real estate game. And SO MUCH MORE. In terms of the practical, instantly applicable information and knowledge you're going to walk away with, this is just the tip of the iceberg. Remember, this system is based on my own personal self-designed system for wealth creation. And I've got to tell you, I couldn't have more confidence or pride in the finished product. But as I said earlier, I'm a bit of a skeptic. And I tend to assume that everyone else is, too. Especially when it comes to "I can make you rich! "-type promises. My wealth-building system can have you sitting atop a 7-figure personal fortune in just 7 short years from now. I know I'm right. I've watched it work over and over. But I don't expect YOU to automatically agree with me based on this letter alone. Order Seven Years to Seven Figures today. Just click on the link below, and the entire program - including 10 CDs plus a bonus CD and an extensive workbook on CD - will be shipped out to you right away for just $98.95 - which is 70% OFF the regular program price. Listen to the program. Think about the strategies my partners in wealth and I share. Start putting some of them to the test. You're going to know right away if this is the wealth-building system you've been waiting for. You'll have in your permanent possession the system that has made me and so many others wealthy beyond our dreams - today, while we can really enjoy and benefit from it, AND for the future. If you change your mind for ANY reason, you can send the program back any time within 30 days for a full refund of the purchase price. It's as simple and straightforward as that. You want to be rich. And you CAN be. The only question is, How soon do you want it? How soon do you want to be freed from money-related worry and stress... able to enjoy all the great things that a life of wealth has to offer... and safe in the knowledge that both your present and your future are secure? If the answer is "as soon as possible" - and if seven years (or very likely fewer) fits your definition of that, then I urge you to start moving toward that goal now, by ordering The Seven Years to Seven Figures System TODAY! I want to have a MILLION DOLLAR net worth in just SEVEN YEARS or less! 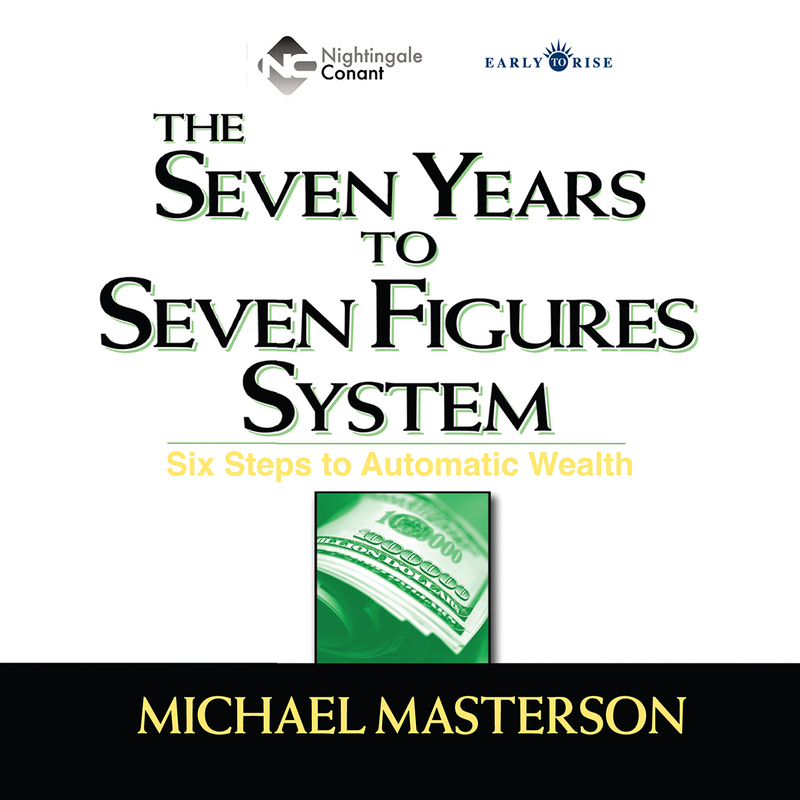 Please send me Michael Masterson's audio program The Seven Years to Seven Figures System, at the special price below. - I can select one of two ways of ordering.